Putting the flavor aside for a second, the chips themselves are slightly thicker and noticeably crisper than the regular Walkers chips. 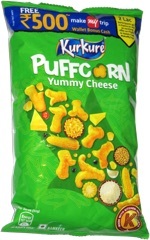 They're conventional rather than kettle-cooked chips, but they have a very nice crunch. The taste is good, but both the onion and the cheese tastes are subtle, rather than overpowering. Four cheeses seems like a lot to fit into a taste this subtle. 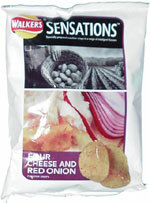 I thought these Sensations were going to be the English equivalent of the premium Lay's Bistro Gourmet line sold in the United States, as they're in fancy packaging that feels thicker than the regular Walkers bags and has "Sensations" is in larger type than the Walkers logo, similar to how "Bistro Gourmet" is used to extend the Lay's brand. But the Bistro Gourmet flavors that I've tried tend to be much more heavily flavored than these. Smell test: Very, very nice onion and cheese aroma. It smells both oniony and creamy.